Established in the year 1962, Lakewood Auto Body has been meeting the car painting/truck painting needs of residents of Lakewood, WA efficiently and professionally. Apart from car painting/truck painting of your Nissan cars, we also perform auto body repair, and mechanical repairs with full dedication and commitment. 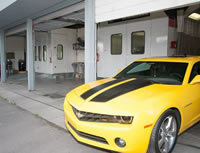 With our state of the art Bee Line frame racks, Shark Electronic Measuring Systems and computerized paint matching systems, we possess the tools and techniques to make sure of a perfect car painting/truck painting and auto body repair. The 27 years of combined experience in auto painting gained by our technicians enables them to provide unmatched auto body painting services and offer first style customer service. Planning to get your Nissan painted in your favorite color with a sleek, shiny, and lustrous finish? Lakewood Auto Body’s range of paints and colors allow you to accomplish an assortment of custom finishes on your vehicle. If your vehicle has experienced a car scratch which is thin and white and has not deeply penetrated in the metal coat, you should get it repaired soon. But if the scratch has penetrated deep enough, it is time to opt for complete re-spraying. Lakewood, WA based Lakewood Auto Body is a locally owned and operated car painting/truck painting shop. We use custom colors and industrial finishes paired with high quality car painting techniques which help us in having a cutting edge over our competitors. At Lakewood Auto Body, we have highly advanced computer paint color matching systems which help us to restore the original look and shine of your Nissan car. Call Lakewood Auto Body experts at 253-581-0220.